Ferretti Group unveiled the latest model in their Custom Line planing range at this year’s Miami Yacht Show: the 32-metre Custom Line 106, which will make its debut in late 2018. 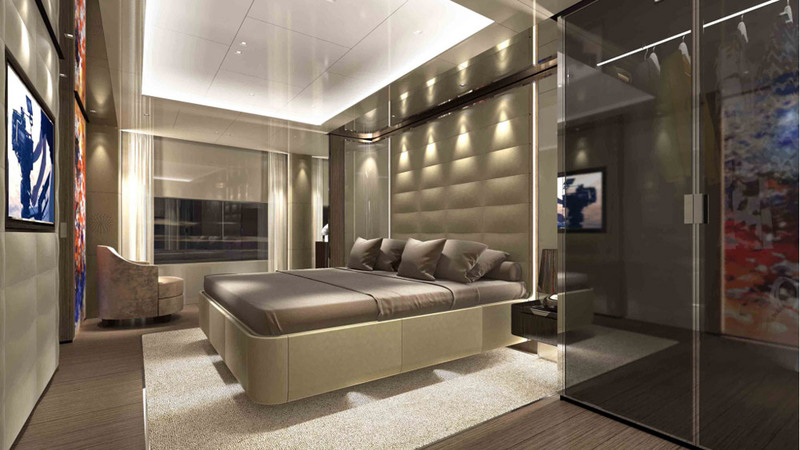 This 32.3 metre design is the second to come from a new partnership between the Ferretti Engineering Department and the Francesco Paszkowski Design studio. As a perfect combination of performance and modern comfort Custom Line 106 is built from fibreglass and features a walkaround wheelhouse, a split foredeck seating area and cutaway bulwarks creating a flood of natural light inside through the saloon windows. The extensive deck area covers 220m² and all areas are interconnected: The stern has a more advanced version of the patented DMT -Dual Mode Transomsystem, where two hatches cover the stairs while in transit, and once motionless the hatches disappear into the central door section so that they can be used by guests. The tender garage allows for the storage of a 505 Williams Jettender and a three-person jet ski, which can be lowered into the water. Moving forward and the Custom Line 106’s foredeck spans a total of 36 square metres, offering storage space for a 2.8 metre Williams Jet Tender or an additional Jet Ski. 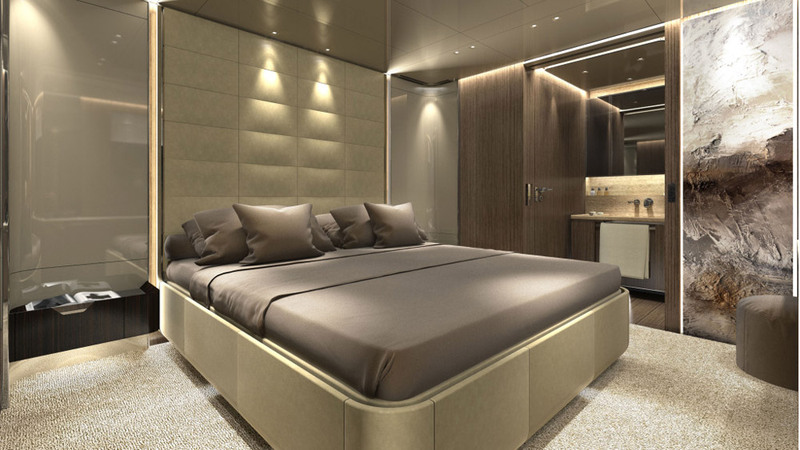 Accommodation is for up to 12 guests split across five cabins, including a main-deck master suite that measures 6.5 metres wide and comes with an optional fold-out balcony. 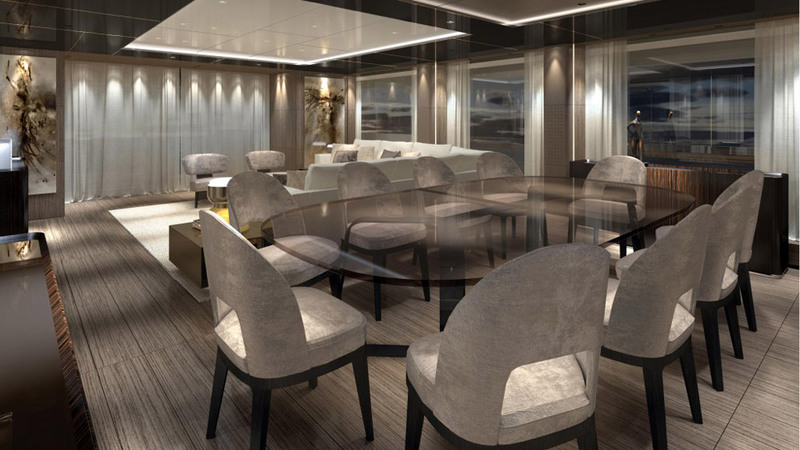 Below decks, two VIP cabins and two twin cabins with Pullman berths complete the guest layout. The interior décor aims to balance formality with distinctive colour contrasts, while the entertainment system can be controlled via iPad. Custom Line 106 is fitted with twin MTU 16V engines which can take it to a maximum speed of 23 knots, according to preliminary data. As an alternative, twin MTU 16V engines can be fitted which can reach a maximum speed of 26 knots. The standard version would also be equipped with electro-hydraulic stabilizing fins, offering both underway and zero-speed modes, however, on request, gyroscopic stabilizers can also be fitted for maximum comfort at anchor.